It happened on Friday, 7th April between 3.20-3.25pm at Eurochange, at the entrance to the Prince Bishops shopping centre. Police are appealing for witnesses after a robbery at a Post Office in Newcastle on Saturday morning. 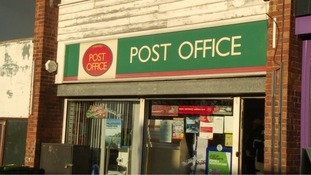 A man went into Benwell Grove Post Office in West Road shortly before 10am and demanded cash. Police believe he may have been in possession of a meat cleaver or axe. He is described as white, aged 40 years old, wearing a blonde wig and black hooded top and was on a white mountain bike. He made off towards Middleton Avenue and Hadrian Road. The member of staff was not injured in the incident. Police are appealing for information after an attempted robbery in Sunderland. Around 9:10pm on Friday, June 17, a man entered the Subway sandwich shop in Chester Road armed with a knife. He threatened the member of staff and demanded money before leaving the store empty handed. The offender is thought to be white, in his 20s, around 5' 5'' tall and was wearing a black jacket with a grey scarf covering his face. He spoke with a local accent. Officers believe the incident could be linked to a robbery that happened at the NISA Local store in Hylton Road around 8:45am on Sunday, June 12, where cash was stolen. The description of the man given after the incident at the NISA store is similar to the one given after the Subway robbery. Enquiries are ongoing in the area and anyone with any information is asked to contact police on 101 quoting reference number 967 17/06/16. Samuel Hughes from Manchester has been sentenced to 12 years for conspiracy to commit robbery in connection to the incidents in Yarm and Middlesborugh. Antony Northmore from Cleveland has been sentenced to 12 years for conspiracy to commit robbery in connection to the incidents in Yarm and Middlesbrough. Police are appealing for information after a robbery in Newcastle. At around 11.45pm on Friday May 13 police received a report that a 44-year-old man had been attacked near the junction of Welbeck Road and Kennington Grove in Byker. The victim had been cycling home when he was knocked off his bicycle and assaulted by a group of four men. The attackers then took the bicycle and fled in the direction of Welbeck Road. The victim was then able to call police. The man was taken to hospital with non-life threatening injuries. The bicycle was recovered nearby. The offenders are described as white men in their twenties or early thirties. A man has been arrested in connection with an incident in which two women were robbed by a man with a gun on Greylands Avenue, Norton on Saturday 5th March. The 39-year-old man was arrested yesterday evening, Wednesday 9th March, on suspicion of robbery, possession of a firearm, theft and possession of a class A drug. He remains in custody. Police are appealing for information after an 85-year-old man had his car stolen during a robbery in the Gosforth area of Newcastle. At 6.53am this morning (Friday, January 22) the man got out of his vehicle on Woodbine Road when he was approached by two men. They assaulted the man, throwing him against a wall before stealing the car and heading towards Salters Road. The car is a three-door silver Ford Fiesta, registration number NK06 RWF. The men were described as being in their 20s, around 5ft 8ins tall and rough looking. The victim was left uninjured but shaken by the incident. CCTV has been released of the robbery of a woman which left her with serious head and facial injuries. The attack took place at 9.25pm on Tuesday 3rd November in Eston. 56-year-old Bernadette Green was walking with her brother and dog. A man approached them and grabbed her bag as he walked past her, pulling her to the ground. He then made off through an alley leading onto Birchington Avenue. The victim had been walking back from a dog training class at Eston Methodist Church hall and the stolen bag contained only a dog lead and treats. The suspect is described as a male in his late teens to early twenties and was wearing a dark hooded jacket. Two males have been interviewed in connection with the attack but each has been released without charge. A 27-year-old man has been arrested on suspicion of robbery after an attempted robbery at Lyndhurst Post office in Wetheral Gardens, Gateshead, yesterday. The man is currently in custody. Police are checking CCTV footage and speaking to residents in an area where a 76 year old woman was knocked unconscious during a robbery. It happened at 11.45pm on Friday in Carville Road, Wallsend. The woman tried to stop one of two men stealing her handbag but was pulled to the ground and injured. A man and woman who were in the area found her and called for an ambulance.